Today I woke up with three or four different topics running around in my head, but they were all driven out by what will go down as The Great Possum Incident of 2010. I went down at 6:00 AM as usual to let my dogs, “the Girls”, out and instead of running out to do their business, they started circling the grill and barking. I thought it was either a squirrel or the neighbor’s cat, which had both happened before. Then I heard the snarl and saw the tail. As possums go, this one was on the large side, about twenty-four inches long. It had crawled under the grill to eat some spilled dog food (I’ll be having words with my son about that) and saw no reason to leave such a cozy, autumn bed. Until my three ferocious girls arrived to put his morning off to a really bad start. A possum will play dead – not a very successful defense mechanism when you are surrounded by three snarling dogs that are determined to get you. I put the Girls in the basement and then put my boots on and went outside to encourage the possum to move on to his next stop. I stomped my feet, it played dead. I pushed with the broom and it played dead and when I poked harder, it snarled at me. That was a scary site – those little sharp teeth and wide gaping mouth. Despite the fact that I am 100 times bigger, I was a unnerved. But I knew if I didn’t get it off the deck that the girls would either get it or get bitten or both. I finally hit on the idea of spraying it with the water hose and that worked and it came out of its hiding place and ran across the deck. It ran until it got face to face with the Girls peering out from the door and then dropped down again, playing dead. I don’t think a possum can be very smart. I mean, why stop and freeze right in front of your worst natural enemy, waiting for it to devour you? Hey, I think there’s a life lesson here! Think of all the times you’ve been frozen with fear. Have you ever been afraid to get a lump checked out because it might be cancer? Afraid to get a physical because you were in such bad shape you didn’t want to hear the results? Afraid to start exercising and eating right because you knew it would be hard? Yes, been there, done that, got the tee-shirt. What finally makes you unfreeze and move? What triggers the fight or flight part? I think there should be three parts, not two. Because before you decide to run with your tail between your legs or stand up to whatever it is, there’s that moment of stillness. That timeless eternity that could last a fraction of a second in a critical situation. Or in my case, it became years of apathy while I was obese and not doing anything about it. What finally triggers you? The bad news from the doctor? The invitation to the big event? The photo you can’t ignore? For me it was falling down in Singapore and being hurt and alone on the other side of the planet. Surrounded by kind and helpful people who picked me up and dusted me off and helped me to the hospital. Those tiny Asians who don’t even have clothes to sell that are that big in their whole country. They were so gentle with me. What must they have been thinking? 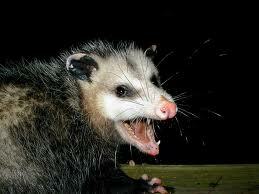 Maybe it was something along the lines of what I was thinking about that possum this morning. Boy that’s ugly! But it’s scared and it needs my help to get out of this mess. Maybe not. Maybe they just saw someone frightened and in pain who needed their help. I would love to go back to Singapore someday and thank all the people who helped me. The people at the Eye, the Army doctors who responded to the call for help, the soldiers who came with them and ended up having to hoist me into a wheel chair, their guns strapped to their backs. The nurses and doctors at Raffles hospital who tended me and treated me and gave me pain pills and salve for my wounds. The specialist who came in to check out my eye and make sure the retina wasn’t detached. The staff at the InterContinental who brought me ice packs and cups of tea and room service while I recovered. For the possum, it was the a wet, frightening morning that ended with scampering off into the woods behind my house, hopefully never to return. But possums aren’t very smart. And there was food under that grill. Tasty chicken and rice dog food. Perhaps tempting enough to risk the snarling dogs and crazy, booted woman with the water hose to get more of it. Yesterday there were a lot of temptations that made me, apparently, willing to risk going back to lying on the ground in Singapore. There was the slice of pizza that I had instead of my packed lunch of grilled tuna and veggies. Then there was dinner in front of the television, which ALWAYS leads to snacking. In this case it was a second bowl of yogurt and blueberries, a hefty slice of meatloaf and two servings of almonds and a dove chocolate heart. That is not weight maintenance, that is more than likely a weight gain. So what was going on? When I finally stopped being frozen and started talking about it with my husband, I realized that this is the week, ten years ago that I found out I’d lost my first baby. I’m also worried about two women I know and like tremendously who are battling cancer, one who will, God willing, be fine and one who, no matter what, most likely won’t. Then there was the frenzy of work – much crazier than I’m used to because of the software release this weekend. The last few days have been like my old job was all the time. It’s clear to me that because this job has been relatively stress free, that I haven’t really learned how to manage that without eating my way through the day. So, today, I’ll work on that and try to be gentle with myself. After all, I’m a fierce warrier, able to banish demons and possum before breakfast. Now I’m going to go run off that pizza! This entry was posted in 1. Planning and tagged Gastric Bypass, weight loss surgery. Bookmark the permalink. Great post, Karen. I love that you write in your head before you put the words down on paper…or in this case, the screen. I do that, too. I compose in my head all day long. It’s a writer’s way! You have such interesting observations on things and connect what is happening right now with things in the past. Thanks for sharing.